In order to gain greater insight into your health, we perform live blood analysis using a special microscope for our patients. The analysis is done while you are having your visit, which allows us to give you immediate feedback on what we see in terms of blood health, and how this can be affecting your immune, nutritional, metabolic and other health challenges. A darkfield phase contrast microscope is a specially designed research tool which enables illumination of otherwise transparent specimens to become visible as various shades of gray. This image is further enhanced when transmitted through a video monitor. Since most biological specimens are colorless, little, if any fine structure and detail can be revealed by traditional methods. 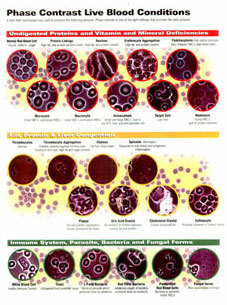 In this example, we provide an image of several blood samples. The healthy sample which is furthest left, top row, in each section. The first sample (upper left) of powerful, healthy blood shows the red cells to be round, evenly shaped in freely floating plasma. The plasma itself is clear and with few fat globules, plaque and uric acid. There are no signs of clotting, bacteria, fungal, or other foreign matter and stress. This is the kind of blood a person SHOULD have flowing through their circulatory system.